Leeks are known to be packed with vitamins, antioxidants and minerals, all the essential elements for the formation of healthy and beautiful body. Often used in cosmetic products, leeks are a natural way to fulfill your daily beauty requirements and a good way to have healthier, stronger skin, hair and nails. This natural diuretic is going to flush out the harmful toxins from the body and make your skin look radiant. Powerful antioxidants in leeks are scientifically proven to protect the skin from the harmful UV rays and repair skin damage caused by free radicals. Leeks as a good source of minerals like manganese and iron are very beneficial for the hair and they are going to make your hair healthy, smooth and shiny. Allicin is the major organic compound of leeks and the product of an unstable chemical reaction of freshly crushed leeks. 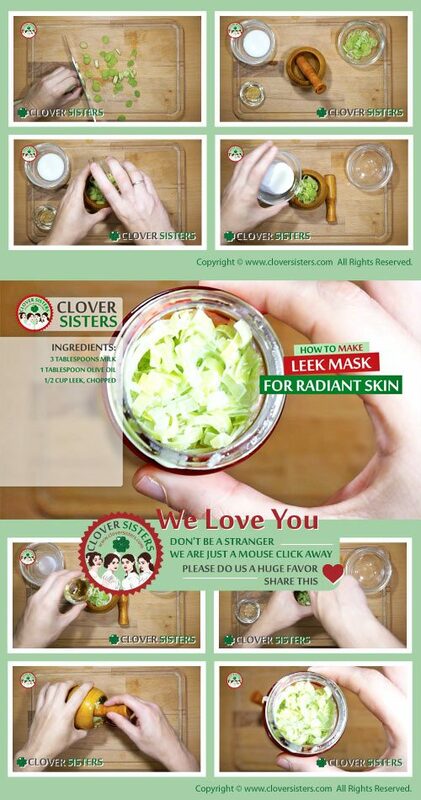 The functional benefits of leeks are its allicin antimicrobial activity which can be used to treat acne efficiently. Vitamin K, an essential vitamin found in leeks, is known as the clotting vitamin, and plays a key role in preventing excessive bleeding. A vitamin K deficiency can significantly alter the skin healing process, and treating new wounds with topical vitamin K cream made from leeks might assist in healing. Iron is an important mineral found in every cell of our body, and our body needs it for many functions. According to some studies, a lack of iron can lead to iron deficiency anaemia and hair loss. Eating balanced and healthy foods rich in iron like leeks helps in the proper growth of the hair follicles and prevents hair loss. Blend leeks and add the olive oil and milk. Let the mixture rest for about 15 minutes and then apply to the skin. Wash it off with water after 10 minutes.